VietNamNet Bridge - Many islands in Vietnam suffer from serious pollution, but no solution has been found to solve the problem. The Con Dao Landfill is located in the valley, surrounded by mountains on three sides and facing Bai Nhat beach. Reporters who visited at the end of 2018 could see piles of waste several meters high. The waste included easily biodegradable garbage and plastic bags and bottles. There is a small incinerator at the landfill. A worker there told reporters that the mini incinerator can treat only one third of the total volume of waste brought there. The Con Dao district authorities said the landfill, covering an area of 4,000 square meters, has been used for 20 years, and only 300 square meters of area remain unused. The incinerator can treat five tons of waste a day, a small figure compared with the 15 tons of waste discharged every day on the island. By early 2018, the amount of waste on the landfill had reached 70,000 tons. The landfill produces a bad odor, and waste water leaking from it now spills over the roads and reaches beaches. The landfill is adjacent to the historical site memorializing the jailbreak carried out by 198 prisoners on December 12, 1952. 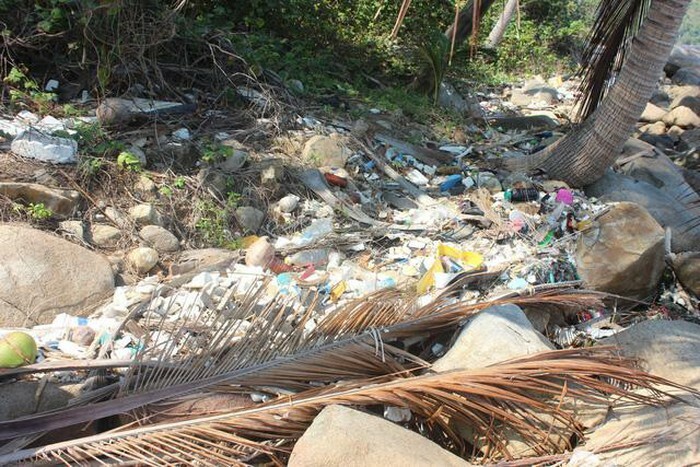 The Con Dao District People's Committee has submitted a plan to carry untreated waste to the mainland. The waste would be pressed into bars and carried by sea to the mainland where it would be treated at the concentrated waste treatment complex in Phu My Town. The local authorities estimated that it takes VND35 billion to carry waste to the mainland. The hot development of the tourism industry in recent years has brought more travelers to the island. In 2014, residents and travelers discharged 140 tons of garbage a day, and the figure now is 200 tons a day. Kien Giang territorial waters cover an area of 63,200 square kilometers, including 145 islands, large and small, 47 of which have residents. The largest island is Phu Quoc with an area of nearly 590 square kilometers and estimated population of over 100,000. As there was no waste treatment plant, all the waste on Phu Quoc was placed on temporary dumping grounds in Cua Can commune and An Thoi town. According to Dang Ngoc Thang from the Kien Giang environment department, the construction of the waste treatment plant in Ham Ninh commune began in the second half of 2017. The plant, which has been operational for one month, receives 130 tons of waste a day.